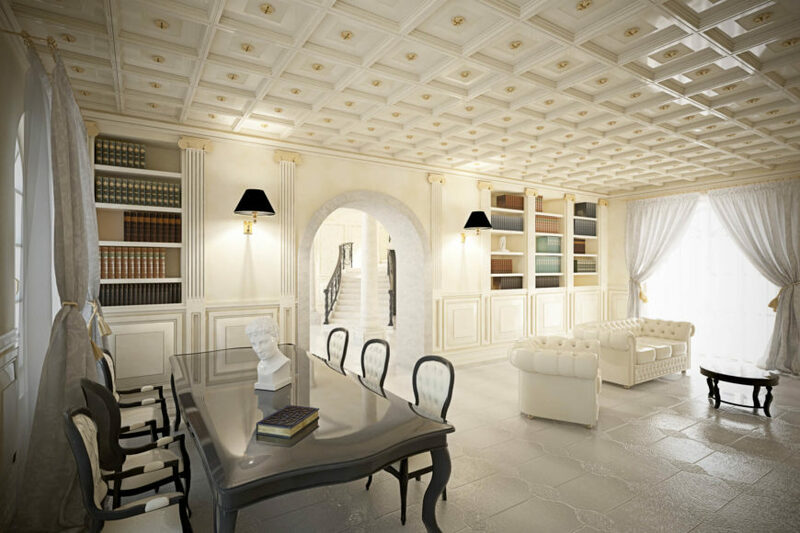 Welcome to our gallery featuring the elegant Neoclassical House, a home design by Brain Factory. This beautiful neoclassical villa is located in the south of Italy, on the Ionian coast of Calabria, overlooking the bay with the ancient Aragon fortress. The entrance to this sprawling home is magnificent and opulent, with a grand a spiral stair coming to life from the central open space. 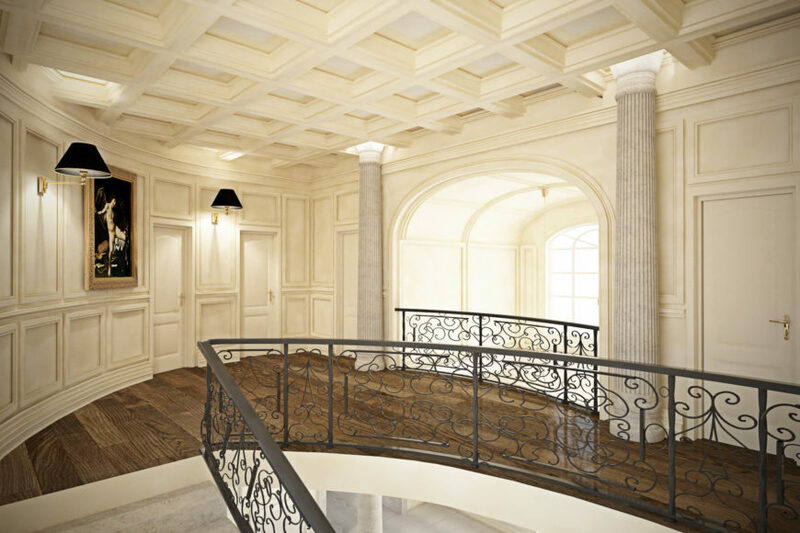 Boiserie, stucco, and wallpaper enrich and divide the architectural language of the rooms. The living room features sumptuous ceiling panels in wood and gold leaf, plus bookcases and wall units perfectly tailored to the surroundings. The upper level gallery is an essential component of the home, with an ethereal atmosphere. Bathrooms throughout are a triumph of gold and embroidery. The neutral palette throughout this residence allows the brilliant architectural structures to really take center stage. Splashes of color and the bold design of various rooms are both surprising and breathtaking, and offer a stark contrast to the rest of the home. 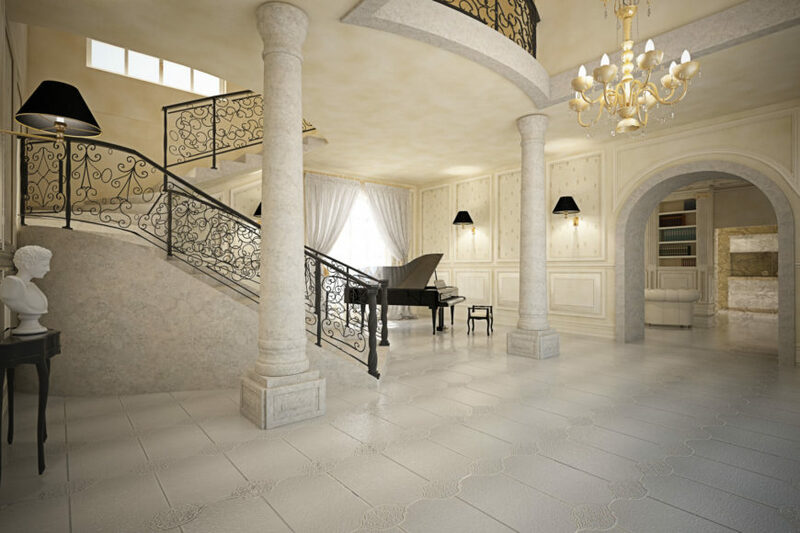 We hope you enjoy this luxury home design featuring the stunning grandeur of classical design elements. Entering the home, the grand spiral staircase commands attention over the open foyer space. 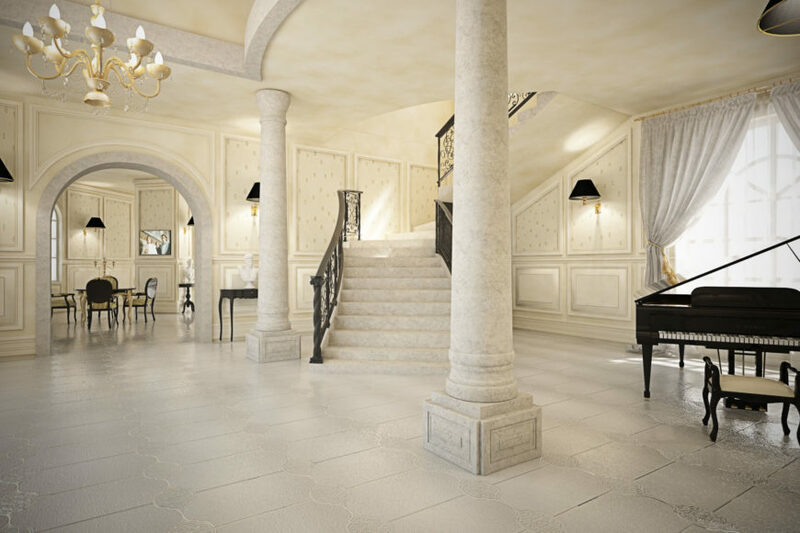 Stone pillars, carved wood and gold leaf, and a singular black grand piano help make the elegant statement. This open living room and dining area combination stands to the side of the main entrance, with a deep black and gold table setting defined by a slim wall at the center. Black and gold trim sconces appear throughout the space. 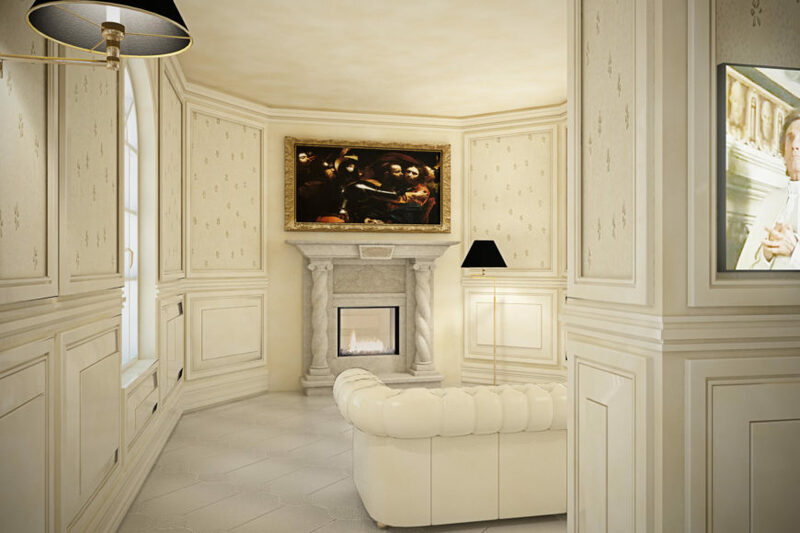 Moving around the central wall, we see a white leather, button tufted sofa facing a fireplace flanked by marble pillars. In this open living room and home office space, we see more of the white leather, button tufted furniture near the full height windows. A large formal table in black stands at left, flanked by rows of white button tufted Parson chairs. This corner of the room showcases the flush built-in shelving and gold leaf-accented ceiling. A slim gas fireplace appears in the right wall. The kitchen houses more of the exquisite mixture of white, gold, and black hues, across the cabinetry, seating, and sconces. 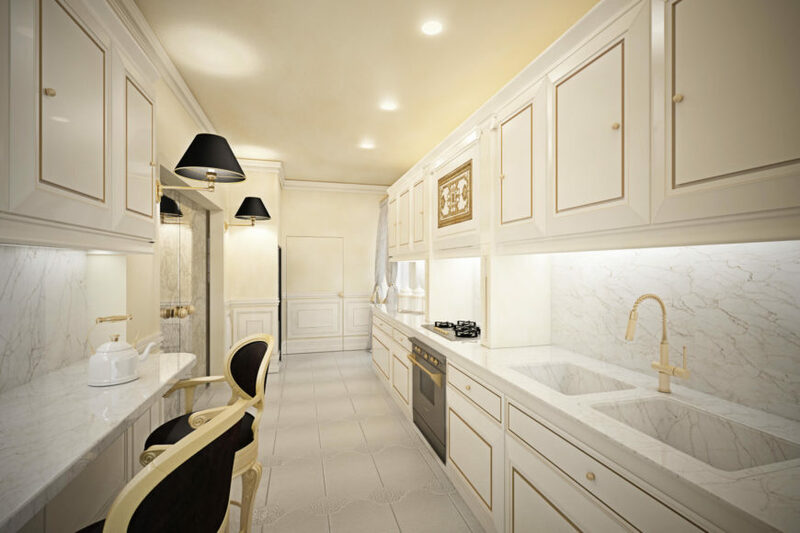 Marble countertop and backsplash contrasts with the clean gold lines. 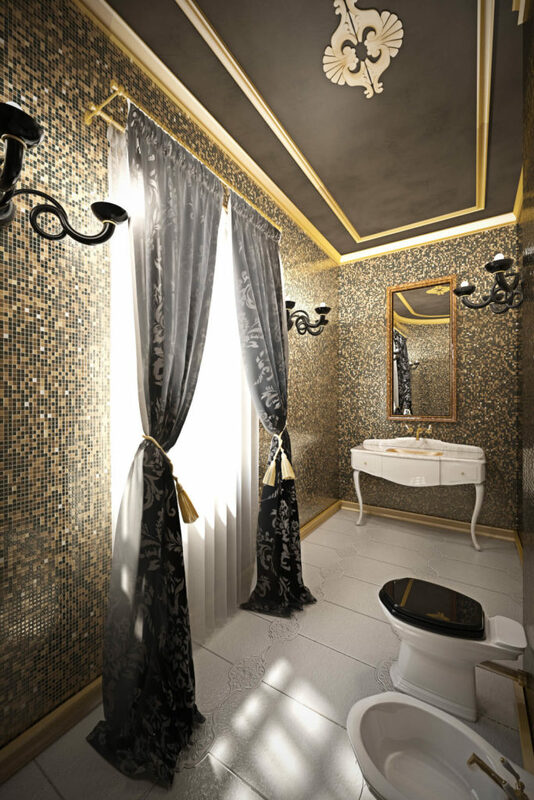 This smaller bathroom features gold and black patterned tile walls and ceiling, plus a claw foot vanity in white for high contrast. Moving to the upper floor, we see a catwalk in rich hardwood, with living room overlook framed by a pair of Greek columns. 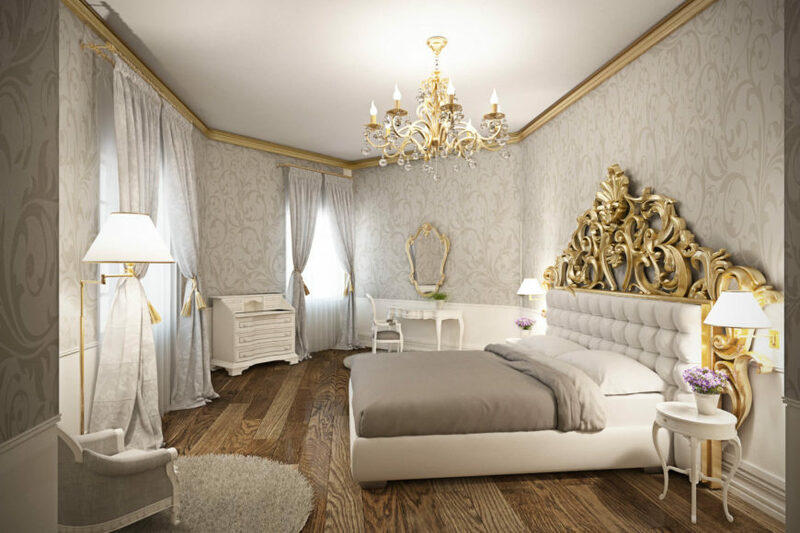 The bedroom wraps subtly patterned wallpaper around a space defined by gold details and white furniture. Natural hardwood flooring spreads beneath bed, traditionally styled seating, dresser, and small vanity. 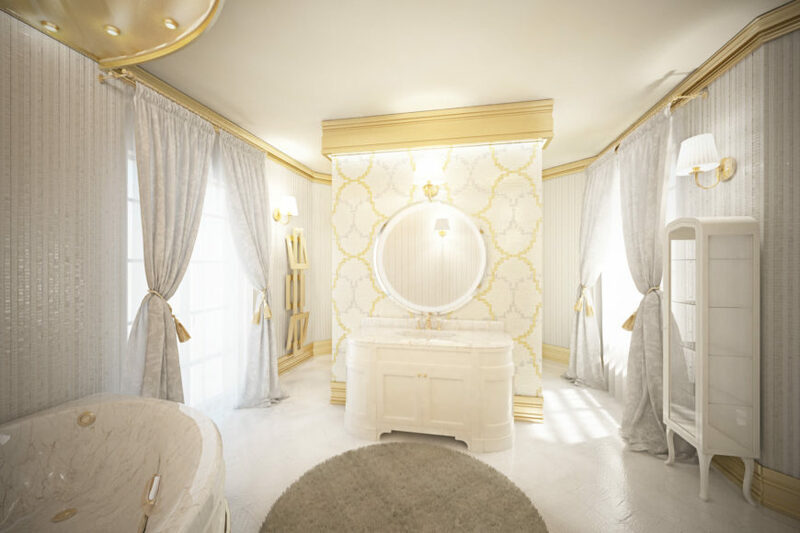 The iridescent white master bathroom glows with gold leaf wall patterns, molding, and other accents. White vanity stands on free wall at center. 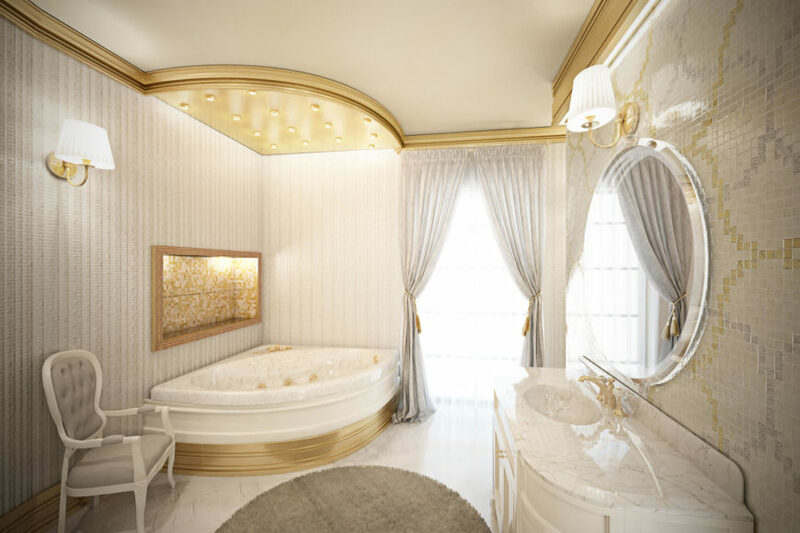 The bathroom houses a large corner soaking tub in marble, framed in gold. Floor to ceiling windows appear in this space as well. This bedroom makes a clear break with the prevailing style of the home, with grey cityscape wall painting, contemporary furniture, and bold red accents. 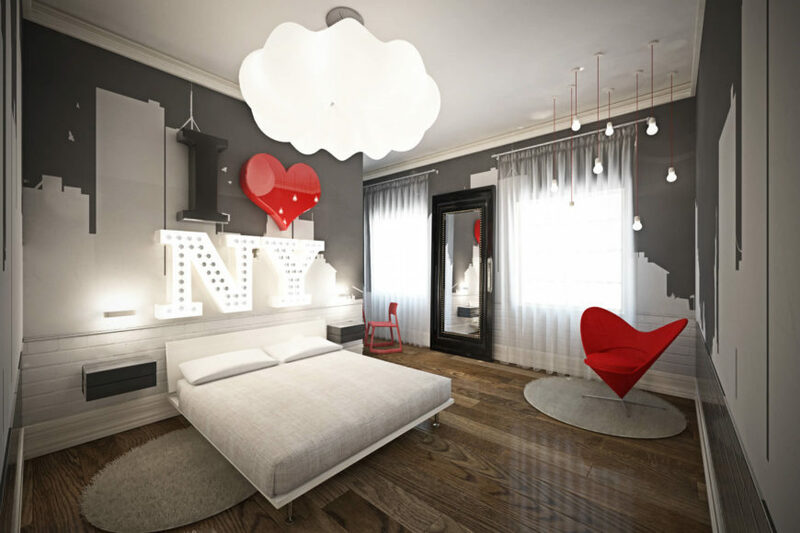 A heart shaped accent chair mirrors the wall mounted heart above the bed. 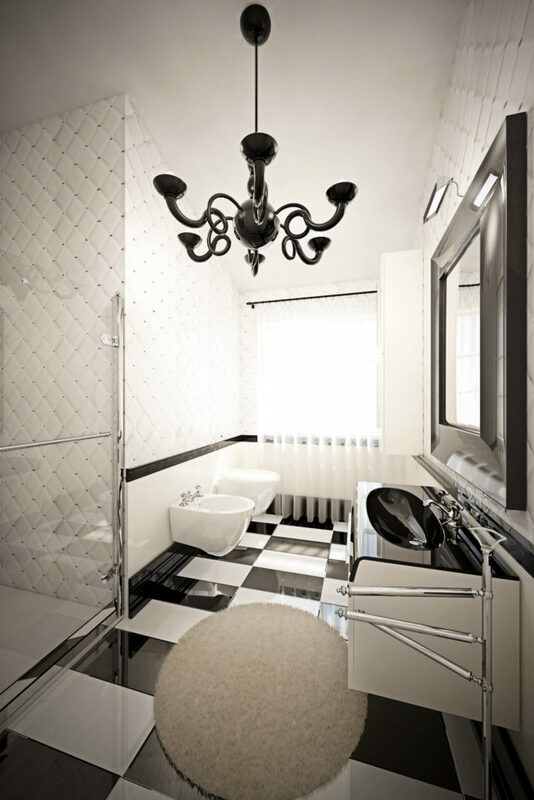 This ultra-modern bathroom features checkered floor tiles and matching, black and white floating vanity with a curved surface. Glass enclosed shower stands at left. This kids’ bedroom features a bright purple motif, with chaise lounge, Parson chair, and bedding matching the striped wallpaper. The mixture of pristine white, purple, and hardwood flooring creates a unique contrast. 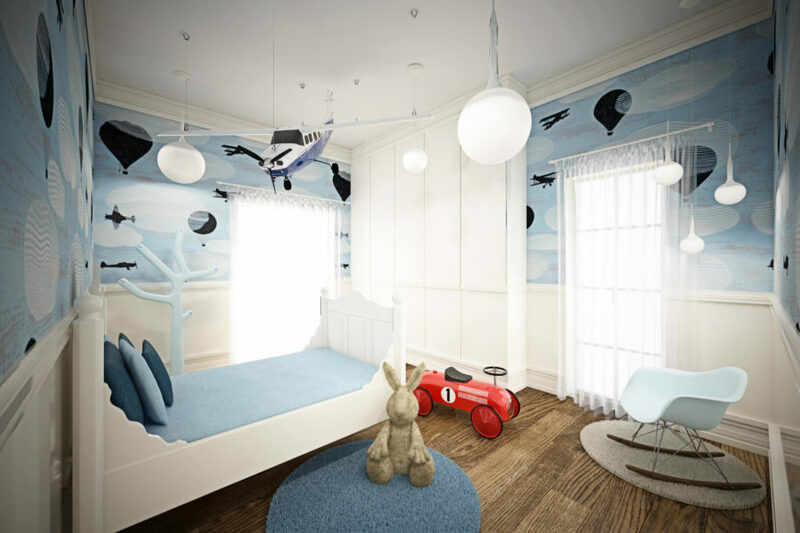 This younger kids bedroom is awash in sky blue and whites, with airplane details painted onto the walls. A series of pendant lights and a model airplane hang above.